And yet thousands of people go hungry in our community every day. Since 1980, we’ve been working with grocers, food companies, Ohio farmers, the USDA, community partners, and people like you to obtain food and distribute it to 650 food pantries, soup kitchens, shelters, after-school programs, and senior housing sites across central and eastern Ohio. To end hunger one nourishing meal at a time while co-creating communities where everyone thrives. 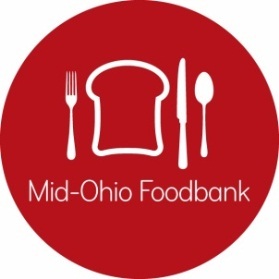 Mid-Ohio Foodbank is ending hunger today, tomorrow and for a lifetime. We provide enough food for about 140,000 meals each and every day to help stabilize families, connect hungry neighbors with community services to help them toward economic sufficiency, and energize the community to address root causes of hunger so everyone thrives. We are leading the conversation on Food Is Health by exploring innovative approaches for our hungry neighbors to access affordable and healthy food to measurably improve health outcomes. We work hard to create and apply technologies, using data to innovate and inform our work. At Mid-Ohio Foodbank Produce Market in Ross County, Phyllis explained “We’re in our late 70s and can make it on social security. We stretch every dollar but produce is so expensive at the store.” Mid-Ohio Foodbank’s Produce Markets are held in partnership with various community organizations and give free produce to low-income families and individuals. Last year, the couple had 45 doctor appointments mostly for Jim’s glaucoma and most of them an hour away in Columbus. The co-pays and prescription costs add up quickly. The couple hopes surgery will give Jim back his eyesight. Mid-Ohio Foodbank distributed about 66 million pounds of food last year, half of which was fresh. Yet there is still a gap. Each year, hungry neighbors in Franklin County miss about 69 million meals. Across our 20-county footprint, about 145 million meals are missed. Organizing to do our best work. Connecting nutritious food to our hungry neighbors. Engaging the community to act.